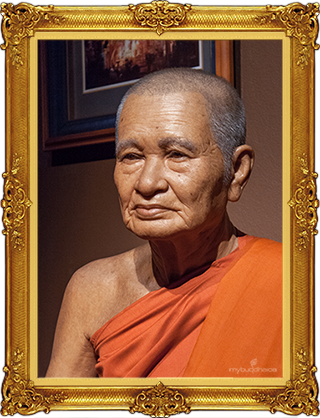 Phra Kru Bhavanarangsi was born in 1902 (BE 2445) in Phra Nakhon Si Ayutthaya province. He ordained as a monk at the age of 21. The prime mover in renovating Wat Yai Chaimongkol. Which was deserted, until official permission was given to become and official temple where the monks can reside. The abbots personal creed is "when one is alone, be mindful of one's own thoughts; when one is among friends, be mindful of one's words."